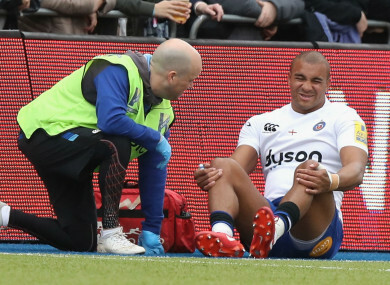 BATH CENTRE JONATHAN Joseph is likely to miss England’s tour of South Africa in June after being ruled out for the rest of the season with a foot injury. Joseph was forced off in the first half of Bath’s 41-6 loss at Saracens on Sunday and left the pitch on crutches. It was confirmed on Thursday he requires an operation that will rule him out of the remainder of Bath’s Premiership campaign, seemingly making it highly unlikely he will be available to face the Springboks in three Tests in June. Bath director of rugby Todd Blackadder said: “JJ is going to need surgery to correct his injury. He will then need a lengthy period of time to rehabilitate. Anthony Watson, Courtney Lawes and Nathan Hughes have already been ruled out for England’s summer tour. Email “Joseph likely to miss England's tour of South Africa”. Feedback on “Joseph likely to miss England's tour of South Africa”.